Hi-Tech Bangla, Inc. is committed to provide quality products and services which meet or exceed the requirements of all applicable Federal Aviation Regulations (FAR's), European Aviation Safety Agency (EASA) regulations, the Aviation Suppliers Association Quality System, the Coordinating Agency for Supplier Evaluation (C.A.S.E.) Standard 3A guidelines, International Standard Organization (ISO) and most importantly to satisfy its customer's requirements.The entire organization is thriving to become the "Partner of Choice" to its worldwide customers and the distributor and channel partner of the suppliers. All employees of Hi-Tech Bangla are responsible to continuously improve the quality of the products and services provided by the company. 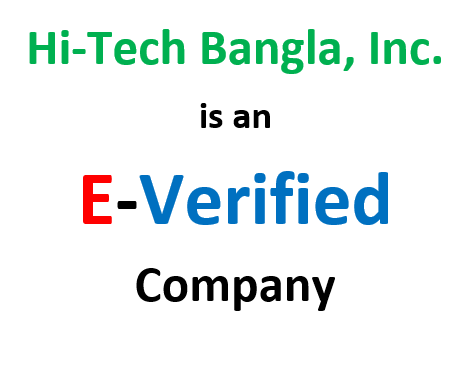 Hi-Tech Bangla, Inc's fosters a work ethic and environment in which every employee shares the responsibility for adherence to all policies and procedures addressed in this manual. Quality Management System of Hi-Tech Bangla is designed in accordance with ISO 9001:2015 and SAE AS9120A requirements.The Hi-Tech Bangla, Inc's Quality Management System (QMS) is divided into four parts. This Quality Manual is Part 1 of the complete QMS. This Manual is the central source of general management operating policies and the assignment of authority and responsibilities for the implementation of those polices. It defines the associated documentation (e.g. Quality Processes, Quality Procedures and Work Instructions) that have been designed to enable Hi-Tech Bangla, Inc. to carry out the Quality Management System. The aims of this Quality Management System is to enhance customer satisfaction through the effective application of the system, including processes for continual improvement of the system and the assurance of conformity to customer and applicable statutory and regulatory requirements.